SMSC stands for spiritual, moral, social and cultural. At The Derby High School, we believe we have an educational obligation to teach the spiritual, moral, social and cultural development of students as part of a broad and balanced curriculum. Therefore ensuring our students’ SMSC development, schools can also demonstrate they are actively promoting fundamental British Values. We acknowledge that the development of students, spiritually, morally, socially and culturally plays a significant part not only in their ability to learn and achieve but in their ability to relate fully to, and have the ability to access the world they live in. We therefore aim to provide students with an education that helps them become self-assured, confident, happy and positive young people and that prepares them well for the opportunities, responsibilities and experiences of life in modern Britain. ♣ Encourage respect for democracy and support for participation in the democratic processes, including respect for the basis on which the law is made and applied in England. 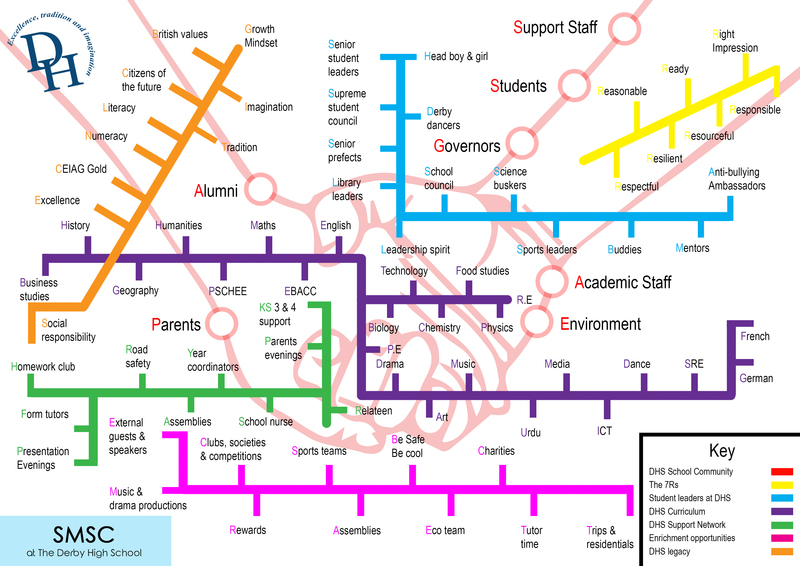 At the Derby High School, we believe in a whole-school approach to SMSC and recognise that all areas of the curriculum make an important contribution to the spiritual, moral, social and cultural development of our students and opportunities for this will be planned for in each area of the curriculum. Beyond the classroom there are many additional ways that SMSC is taught, fostered and embedded at The Derby High School. This includes through the sharing and adherence to an agreed school ethos and set of values, most noticeably the 7 Rs, positive relationships throughout the school, Student Council, Senior Student Leaders, Student Voice, trips and visits and the vast extra-curricular programme offered by the school. Additionally, the school assembly rota helps to ensure that students are versed about the world around them and encourages them to reflect on current affairs. ♣ Developed a knowledge about different aspects of culture, including an understanding of historical development and context of Art, Drama, Design, Literature and Music. ♣ Attended professional concerts and plays. ♣ Taken part in a dramatic performance. ♣ Have full access to the school library, including timetable library lessons in year 7,8,9 and been exposed to a wide range of books, as well as for other research materials. ♣ Regularly made use of digital technology to see, read and listen to great culture, no matter where it is situated in the world. ♣ Been guided into further and higher education and employment through a bespoke curriculum in year 11 to cater for these needs and one to one connexions interviews. ♣ Been supported to take particular talents and interests forward. ♣ Had a chance to learn about careers in different industries and been supported to find work experience in these areas, should they wish to pursue it. ♣ Had the chance to lead or shape activity in school by helping with a club, acting as a senior student or sports leader or helping in the school library. Students’ spiritual development involves the growth of their sense of self, their unique potential, their understanding of their strengths and weaknesses, and their will to achieve. As their curiosity about themselves and their place in the world increases, they try to answer for themselves some of life’s fundamental questions. They develop the knowledge, skills, understanding, qualities and attitudes they need to foster their own inner lives and non-material wellbeing. ♣ willingness to reflect on their experiences. Students’ moral development involves pupils acquiring an understanding of the difference between right and wrong and of moral conflict, a concern for others and the will to do what is right. They are able and willing to reflect on the consequences of their actions and learn how to forgive themselves and others. They develop the knowledge, skills and understanding, qualities and attitudes they need in order to make responsible moral decisions and act on them. ♣ interest in investigating and offering reasoned views about moral and ethical issues, and being able to understand and appreciate the viewpoints of others on these issues. Students’ social development involves pupils acquiring an understanding of the responsibilities and rights of being members of families and communities (local, national and global), and an ability to relate to others and to work with others for the common good. They display a sense of belonging and an increasing willingness to participate. They develop the knowledge, skills, understanding, qualities and attitudes they need to make an active contribution to the democratic process in each of their communities. ♣ acceptance and engagement with the fundamental British values of democracy, the rule of law, individual liberty and mutual respect and tolerance of those with different faiths and beliefs; the pupils develop and demonstrate skills and attitudes that will allow them to participate fully in and contribute positively to life in modern Britain. Students’ cultural development involves pupils acquiring an understanding of cultural traditions and an ability to appreciate and respond to a variety of aesthetic experiences. They acquire a respect for their own culture and that of others, an interest in others’ ways of doing things and curiosity about differences. They develop the knowledge, skills, understanding, qualities and attitudes they need to understand, appreciate and contribute to culture.